Direct Mail Can Lift Response Rate by 118% | MB Magazine UK | Discover the latest in technology, reviews, guides & features. Direct mail marketing may be traditional, but it’s certainly not ‘past it’. In fact, this method of communication has proven to lift responses by 118% when combined with email marketing – pretty good for an old-hat. Today, the average person receives 121 emails in just one day, and 49.7% of those are marked as spam. That’s an awful lot of risk for your marketing plan to get lost in junk (literally). However, direct mail marketing allows you to place your message directly into the hands of your prospects. If your marketing is tangible, it automatically receives a better response rate. Washington Direct Mail, a UK mailing house, has researched the successful ideas for direct mail campaign planning, and are sharing their tips. All successful marketing strategies begin with identifying your target audience. To see an increase in responses and, subsequently, revenue, you need to target the correct prospect with the products or services that add value to their life. Anything less and you might as well stop now. Put the resources into producing hyper-accurate data of your customers, whether you buy online or use your existing database. We also recommend segmenting your consumers further to produce personalised copy and mailing. If you know a particular demographic is interested in a certain type of hoover and has, in the past, purchased relevant products – use that knowledge to your advantage. You could even buy ‘lookalike’ profiles of that audience, to expand your customer base and reach out to more prospects who are likely to be interested in your message. Today, data is so readily available. If you don’t know your customers yet, you are destined to fail – it’s as simple as that. In order to appeal to their buying habits, you must personalise your mailing to engage their curiosity. We can bet you often ignore direct mail addressed to the ‘homeowner’, so you should expect your audience will too. 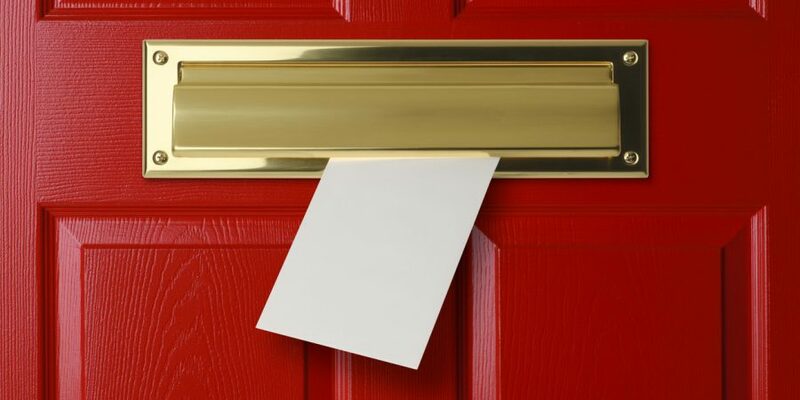 Recent reports have suggested more than 84% of consumers would respond and even purchase from the brand if they produce personalised direct mail. A further 86% said they have connected with a brand due to receiving direct mail. Don’t waste your opportunity to get in the home of your prospects. A picture paints a thousand words, and it’s the same for direct mail. Brilliant graphics and copy should support your message, crafted with the audience in mind. In our experience, minimal and eye-catching text is best suited to direct mail. Your audience wants to know what it is you’re offering, and whether it’s worth their time. For example, the best results come from direct mail offering discounts as everyone loves a freebie, so make sure your copy and design reflect the message. Jargon and paragraphs of text do not, typically, appeal to customers. As we mentioned above, people respond to discounts or offers. If you want to encourage the prospects to visit your site and make a purchase, you must give them an incentive. Why should they go out of their way to ensure your direct mail campaign is a success. However, a call-to-action will strike that chord and contribute to the success of your marketing. A clear call-to-action must always be present with mailing, but do not overwhelm your readers with several. One or even two offers/discounts is enough. After distributing your direct mail campaign, you must always measure the success. If you do not have plans in place to track responses, how will you ever know whether it was successful and if you can replicate the mailing in the future? You can measure your responses through a variety of methods, such as adding QR codes or specific URLs to the product and tracking the visitors through those channels. In turn, this will provide a deeper understanding of their buying habits and if your products are relevant to their life. As mentioned above, you’ll also, hopefully, be able to replicate the marketing in the future, with direct mail increasing ROI by up to 12%. Over the past year, we have seen more instances of direct mail integrated with digital advertising. Programmatic mail is one such example and is a method of modernising communication. For example, if a customer visits your website and places something in their basket, but abandons their cart, you can chase them up with direct mail. You can deliver highly personalised mail reminding them your product is still in their basket. While you can just send an email at a reduction of the cost, it’s more likely that will get ignored or be delivered straight to their junk folder. However, reminder mail delivered through their door boasts more chance of standing out. Ultimately, direct mail has proven success rates of communicating with your audience. It would be foolish to ignore the statistics, particularly in the digital age of overwhelming email marketing.